Predicting Wenatchee has been a major challenge for me and since it's a 3 hour drive one way I have to commit before any major gradient develops. However my confidence was very high for Friday with rain in the west and +85 on the East side. The moderate (0.18) gradient combined with nice heavy clouds at the west end of the lake produced much better wind than I was expecting. I met Owen at the beach well powered with 5.0/96L and after one very overpowered run with 5.7/106L I settled into a great 5.2/106L session. Decent swells by Wenatchee standards on the South side and a nice flat spot to gybe in near the beach made for a great 4 hours on the water from 1230-430. Having my personal photographer along was icing on the cake! My first post to this group. It's been fifteen years since I have sailed seriously following a back injury in 2002 which was "fixed" in 2012 if there is such a thing. I sailed continuously from 1982 to about 1999 when I tailed off as I got into car racing. Fast forward to ten days ago making a trip down memory lane to sail in Hood River. After paying the spiders ransom to collect my gear out of the garage, it was time to clear my own cobwebs. I think my newest piece of equipment was made in the mid to late 90s so imagine my trepidation of being laughed off the beach. In reality that didn't happen but I was impressed with the current state of development of foils which were just a curiosity when I last sailed. 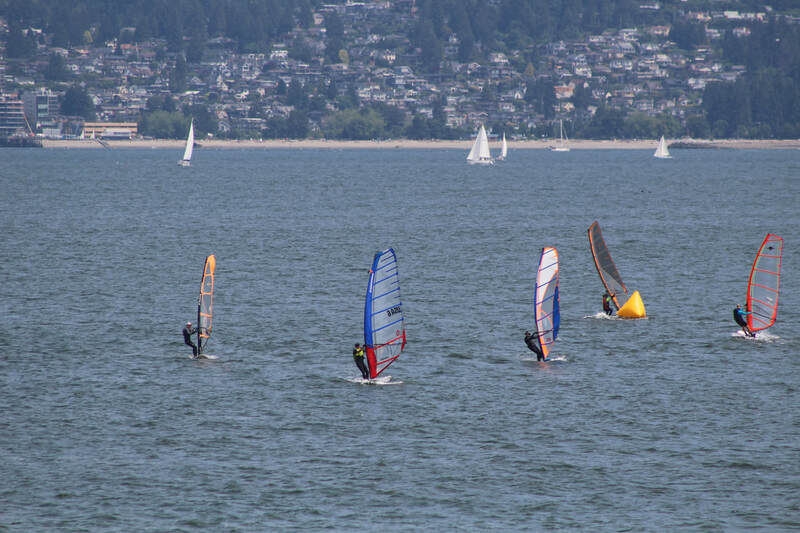 Fascinating to watch sailboards and kites up on foils everywhere I looked. 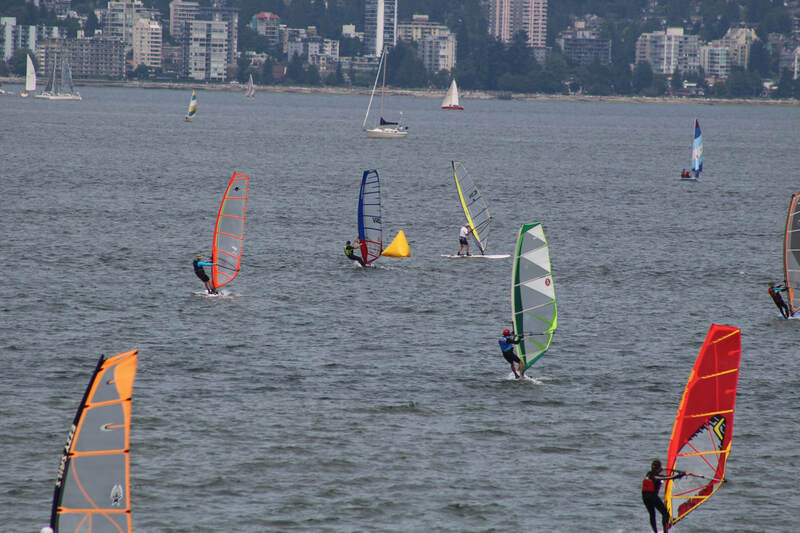 Especially fun to watch were the strapless kite foilers who seemed magically stuck to their kiteboards. It was reassuring that my old 5.6 Sailworks Syncro on a 9.6 AHD race board were faster than the foils but they just look like such a cool challenge. Old habits returned quickly although my jibes sucked - I just couldn't quite muster the commitment needed for effective execution. The gradients were looking good for Lake Wenatchee and several windtalk members made the long drive to find sunny weather, cold water and gusty conditions. Don and Grant, eager to get foiling, rigged small and both attempted the lake on a a pair of Slingshots. Bari and several others went with larger gear which had them blasting most of the afternoon. With the wind coming up and both feeling a little kicked about the foilers went for traditional boards and made the best of it. This week I received the Neil Pryde RS:Flight Alu foil. With exception of the Horue H10 that was sold out in 1-2 days, this foil is one of the less expensive in the market together with the Manta foil. After reading a comprehensive test of various foils on a French magazine here I decided to try to get a Neil Pryde because of its wider wind range. An initial search among US retailers returned a negative outcome, as they are waiting their first shipment later this month. Therefore, I investigated alternative options, and succeeded in finding one in a UK store. The experience was painless as I ordered the foil on a Saturday and received it the following Wednesday through UPS. Given the favorable currency exchange, the total price was only slightly higher than the US price once shipping and taxes were taken into account. The foil arrived well packaged into a box together with all the hardware and a 2 page assembly and tuning manual (see photos). It took 10 minutes to put it together. The package did not include grease as the Manta's or thread/teflon tape as the Slingshot's, and the assembly manual does not mention anything about it or about maintenance. I am still trying to get direct information from Neil Pryde. Still the British store told me that Neil Pryde suggests to take it apart every couple of weeks and rinse it with fresh water even if all the component are marine-ready. I plan to get some teflon tape anyway to reduce the risk of loosing otherwise difficult-to-find hardware. Work commitments and a few windless days postponed the water test, so I took a chance to try the foil on a couple of perspective learner boards (2002 Starboard F136 and 2001 Starboard F155). Here are some initial impressions on the board installation and some specific features of this foil. Differently from other aluminum foils, the head is welded into the mast, which may provide some issues but also save some weight. The first issue is water going into the mast from the bottom, but Neil Pryde took care of that by creating a couple of small drains, one in the bottom of the fuselage, and another on the back of the tuttle head. When I took the board out of the water on my initial test, I realized these drains are there for a reason. The second, and maybe more serious issue is the threading. Since the tuttle head cannot be separated, it is very important to take care of the threading (otherwise, I am not sure if some local shops could re-thread the head). The British shop repeated me twice to use only the right screws (this foil use US threading, which is unusual in europe where metric threading is prevalent). The board came with 2 x 45 mm screws. I decided to check if I had the right screw to install the foil on one of these boards. Luckily, I have a good inventory of US screws (a previous lesson learned from messing up the threading of some expensive custom slalom fins was to order an almost full set of metric and us screws). Once in my garage, I had to think how to connect the foil to the board without dropping either one. First, I tried to place one of the boards on two sawhorses and install the foil from the bottom. It was not a good idea. It was quite difficult to find the right alignment. I flipped the board and carefully placed the foil into the box. It was tight so I felt confident it was not going to fall down while securing the screws. Since the provided screws came with very small washers, I decided to add some wider washers to redistribute the load on the deck. I also added a rubber washer between the metal washer to allow some minor movement. Once I found the right length of screws, I used a permanent marker to note it on the board (it would make easier to secure the foil to the board on the beach). Once the foil was installed, I decided to remove it. At the beginning I was hesitant on how to remove it (it is not easy to remove a 8-9 pounds aluminum foil that fits tight into a light formula board). I certainly did not want to drop it and damage the G10 wings. I learned that the best approach was to push down the board tail with one hand and lightly hammer the front of the mast with the palm of the other hand. Once the front of the head was a little bit out, I repeated from the back, and so on. It did not take long to unsecure the foil and gently remove it. Fast forward to Friday, and I got potentially ideal conditions for a learning test. To prepare myself, I reviewed training videos from various sources, including the Foil Academy by Slingshot, tutorials by Horue, a video by Robby Naish, and an excellent tutorial by Hood River's MacRae Wylde. I developed my own checklist and I was ready to go. Once on the beach at Browns Point, I found wind 8-10 knots with gusts around 12 knots, which seemed ideal and safe to try my new toy. 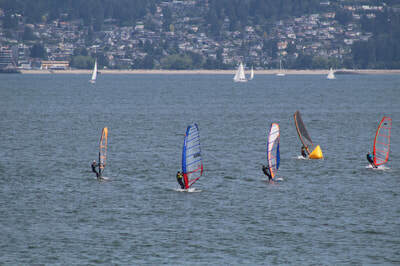 For my initial session, I used the Neil Pryde RS Flight ALU foil on a 2001 Starboard F155 and a Naish Cruz 7.0 (freeride sail without cambers). I am 155-160 lbs. I think the longer and heavier board contributed to keep the bow down and reduced "foiling out" to 3-4 instances [Note: Foiling out means foiling too high with the foil getting out of the water reducing ability to control the board]. In my initial runs, I aimed on a reach, placed the foot in the front strap, started pumping, and then pressured down with the back foot to facilitate the take off. I was able to "fly" the foil, but I was not ready to it as I did not know where to place the back foot and how much to pressure it. Results: a couple of falls. Also, I am not used to sail without harness, so my forearms were getting tired. Still the initial falls showed to be manageable, and provided me comfort in taking the risk of using an harness, so I returned to shore and wore a waist harness. In the meantime, the wind had dropped to 5-6 knots. I decided to continue sailing while waiting for the breeze to return (per forecast) and to assess the board/foil combo behavior when schlogging. I kept going for 1.5 hours with just 1-2 short water breaks. While underpowered, the combo glides well and point much better than the same board with its 70 cm fin. This should guarantee a return to shore as long as the wind does not totally die on me. After a water break, I noticed some gusts in the bay, so I launched again. After I had spent almost 2 hours on the water, I was not much more comfortable with foot pressure. I was able to go and fly. Still, I had a doubt: am I foiling very low or just planing? Except few 30-60 ft long runs at mid-mast (mostly downwind or upwind), I was mostly planing (or low foiling?). The NP foil is very stable and I need to dig my heels into the rail (especially back foot) to speed up. Certainly, this is not a foil for standup/freeride posture. 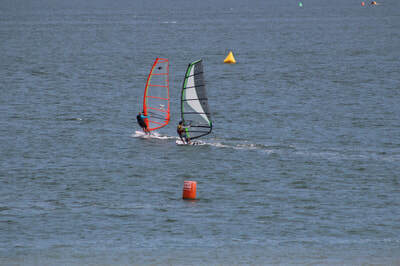 It seems more prone to slalom as stated by the French magazine, but it is quite easy as a freeride foils is expected to be. Going back to the initial impressions, while planing/low foiling the water noise was much less than usual. I felt I was flying just 15-20 inch above water between chops. Once on each 1-2 ft chop, the leeward rail at the tail and the board under the front footstraps were touching the water. Damage/fall assessment: I foiled out only 3-4 times over a total of 4 hours and ~19 miles (mostly schlogging) and had 3-4 rough touchdowns but nothing serious. No damage to gear or sailor. Shore interest: This is a eye catcher. Several people approached me to ask what I was doing, and many other on the beach were watching me closely especially after I foiled out a couple of time close to shore. I guess they had noticed the board 3+ feet above water and me crashing. 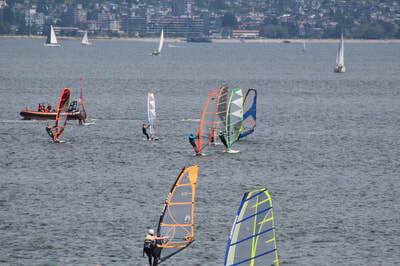 Once resting at the end, an man in his late 60s got close to my board on the beach to observe the foil, and introduced himself with "I built a hydrofoil as my high school project." We had a long chat about foils and their evolution. He is a local keelboat sailor, and has cultivated a lifelong interest in foil evolution. 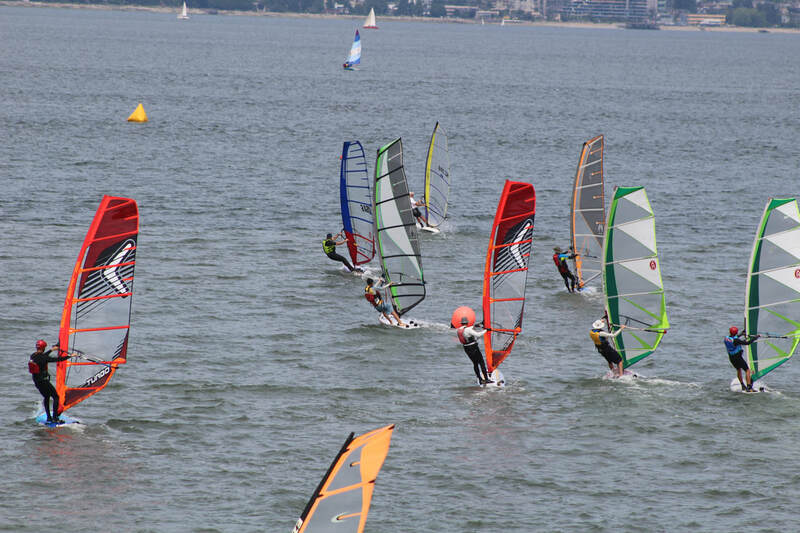 I did not know about the recent push toward windfoiling in windsurfing. Most notable feeling: While schogging, I started a jibe and the board started to react lively. It was not feeling a schlogging jibe. Halfway into the jibe, I realized I was almost 2 feet high. 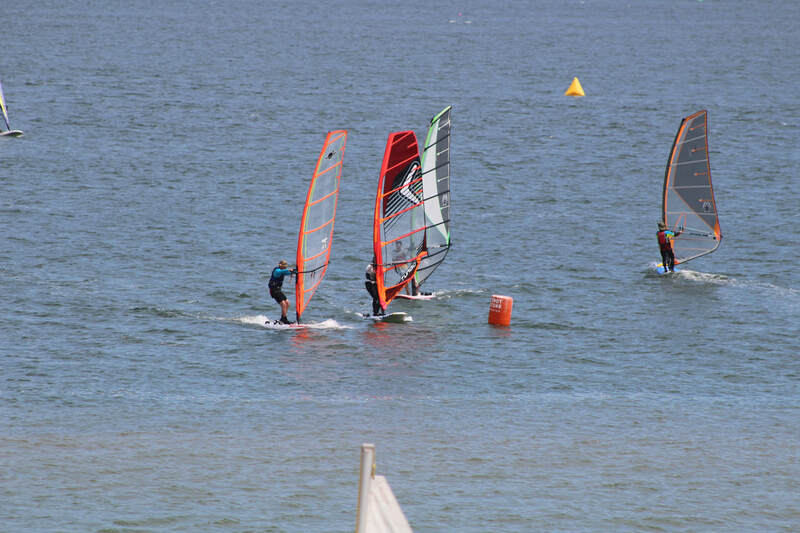 That affected my concentration :) so I touched down 2/3 into the jibe but managed to not fall. 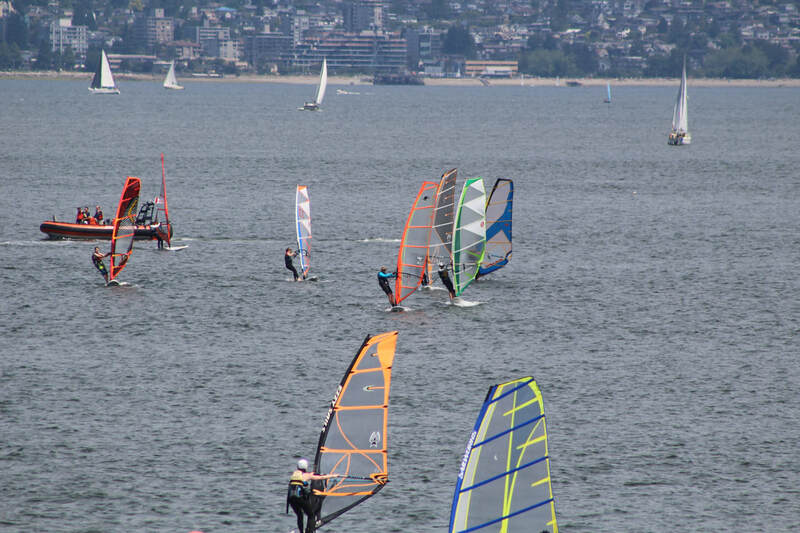 As described by other, foiling provides the same initial feelings that we felt 10/20/30 years ago while learning windsurfing (in my case 31 years ago). 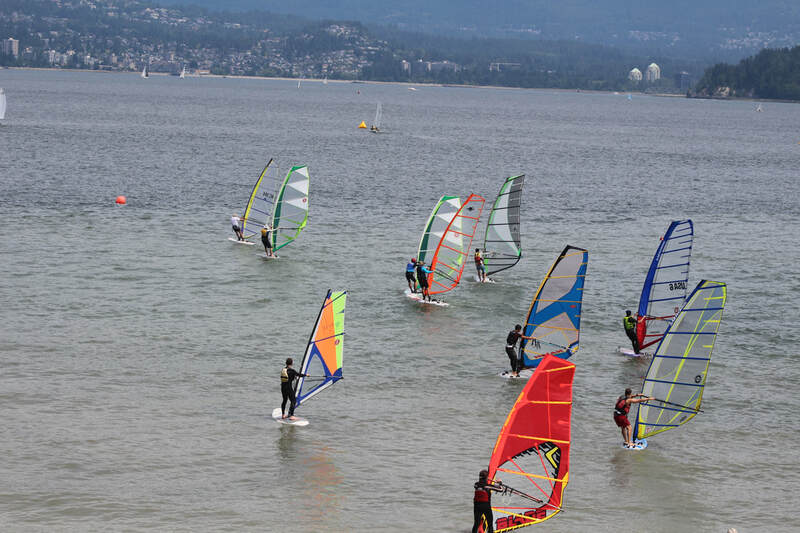 However, we carry all the muscle memory from years of windsurfing and windfoiling is exactly like windsurfing (until on the water). It becomes something different at take off, which will make some unexpected falls to happen until a new balance is acquired. One of the great things is that this can be done with a much smaller sail (on yesterday conditions, I would have rigged a 9.5 on my longboard or a 11 on my formula). The smaller rig and some additional safety measures (no back footstraps, impact vest and helmet) reduce the risk of injuries. Ideally, no harness would be best for the initial runs and falls, but I felt comfortable to wear an harness after the initial 30-40 minute practice runs. 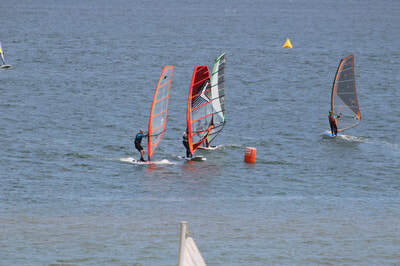 Certainly, it is best to learn in a 8-12 knots wind range and small chop as falls are slow motion and less brutal. Ok... City League #3 DID happen... 5 races were run!! We had a GREAT fleet with 10 racers, "thanks to all that could make it". We missed a couple regulars and couple newer sailors... if they had been there, it would've really been an epic night for participation. Anyway, the evening weather was decent enough... no rain, not cold, mostly cloudy but with a bit of sun poking through at times. Greg, Kona One and 11m sail. We didn't have a Race Committee... so we did a modified timed countdown, and I handi-capped the fleet based on sail size and sailing experience. My goal was to start the folks who were newer, and or, had smaller sails FIRST to give them a "head start". Then the main fleet would start, the goal being to have a big group of sailors together, for a longer section of the race compared to what happens in a normal race start. And again THIS was successful... for example Bari has the least experience, and has the smallest sail... yet she was right in the thick of things, in many of the races. This is more fun for her, cause she gets to be in the main pack for a while, observing what those with more experience are doing. And it's fun for the experienced group, as they try to catch her!! ​City League #1 was Epic FUN !!! Wind speed? I'd guessed early in the day (below) that we'd get 5-10 and hopefully a bit more than that, for the evening. And well... we did get MORE THAN THAT... we had 10 to 18 mph (lots of 12-16 primarily, with whitecaps) wind from 6:30 till dark. I started rigging at 5:45 when it was dead calm and others were out SUPing. By 6:20 they were back and rigging... we all hit the water after 6:30... we got the first race off just before 7 pm. We ALL rigged our biggest sail... and tuned them for light wind... with less than usual tension on downhaul and outhaul. We all had full and deep draft jumbo sails... with the leech and head, as full and taut as we could, to catch the expected light breezes. We had a small fleet, with some of the usual's not there. Six sailors braved the weak forecast, and showed up... and as it turned out, everyone was REALLY happy to be there!! Darius, Jonathan, Andrew, JohnM, me... and relatively new sailor, Plamen (who again surprised us with great longboard sailing with a big sail, in windy and wavy / swelly conditions). We all had sails from 9 to 11M. It's very difficult to sail downwind with a sail a bit too big for the wind, and in very choppy water.. but this crew has been working on that, and it showed. Andrew and I were on Kona One Design boards. Plamen on a Mistral Prodigy. John on his Bic Bamba, Jonathan on Fanatic Mega Cat. And the coolest board there was Darius' new (only slightly used, looks perfect) Starboard Phantom 373 L raceboard (297 Liters of pure beast). 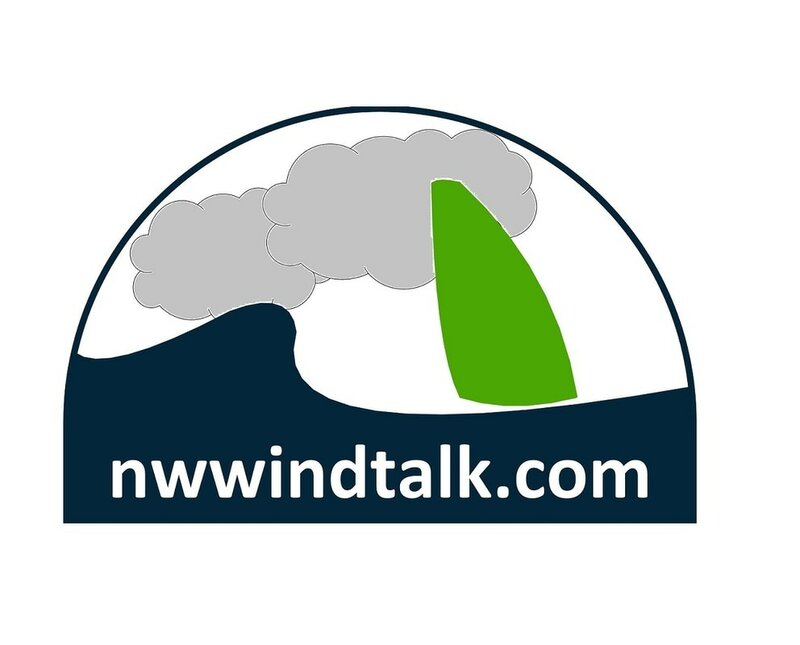 We also had a nice bunch of windtalk visitors there to hang out with us - Erica Church (Lee's wife)... Wilson (and family)... DanO and Kelli :) And I think we might be seeing some pics in a few days... that brave Erica and Wilson took, while standing in wind, out at the end of the pier. So yes... we only got two races run... because of the late start... and because we were all worn out, after 2 races in more wind than our sails could handle comfortably. After the 2nd race most everyone stayed out, beam-reaching back and forth (BAF)... which is much easier than racing up and down wind. We were all fully laid out, over the water, and in the back footstraps on our longboards, reaching BAF !! Two hours of great, fully powered-up sailing... awesome sunshine and blue sky with great views of Mt. Rainier and the Olympics... and the warmest day in 7 months! !